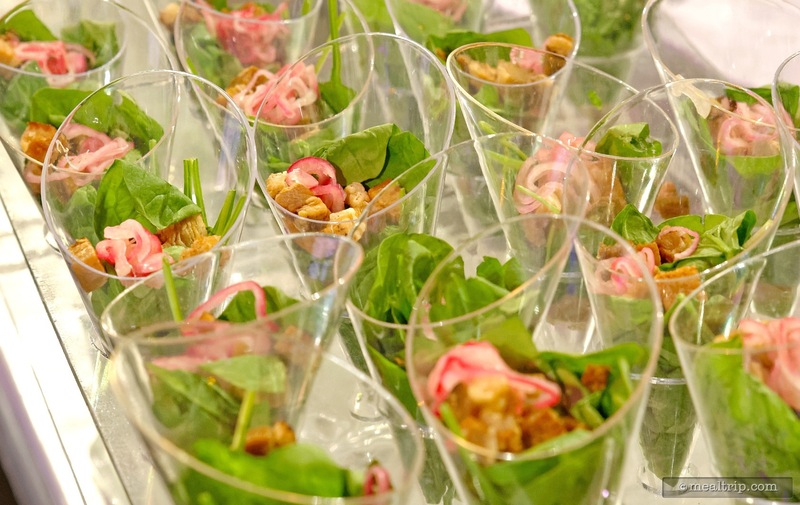 A plate of magic, a side of fantasy, paired with a glass of inspiration and wonder. 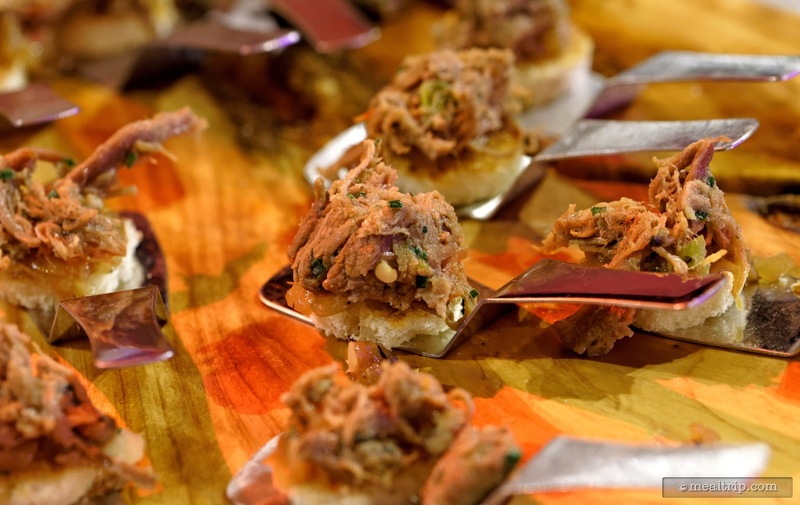 This may not sound like your ordinary meal, but then again Walt Disney was no ordinary man. 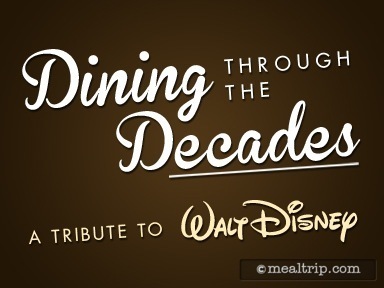 Join us for Dining Through the Decades, A Tribute to Walt Disney, an evening where we celebrate the life and creative inspiration of our founder Walt Disney. 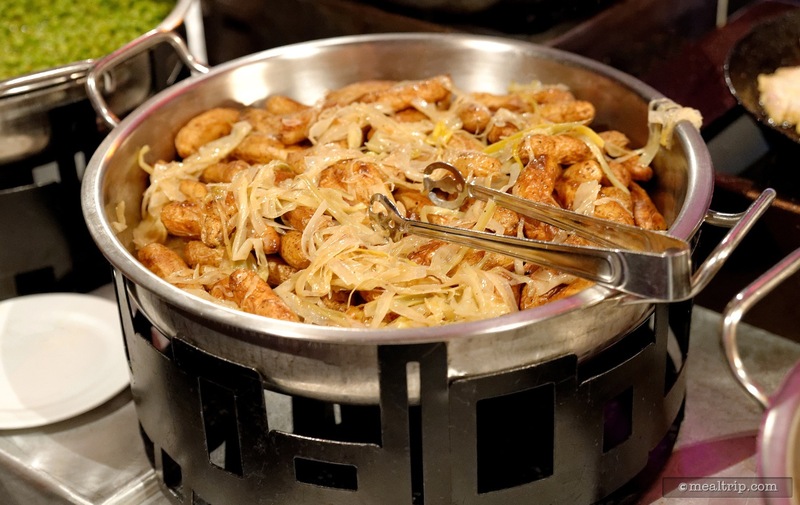 Discover and sample some of Walt's favorite meals at interactive cooking stations and pair your dishes with specially selected wines, each with their own unique Disney connection. This isn't just dinner, its dining happily ever after. 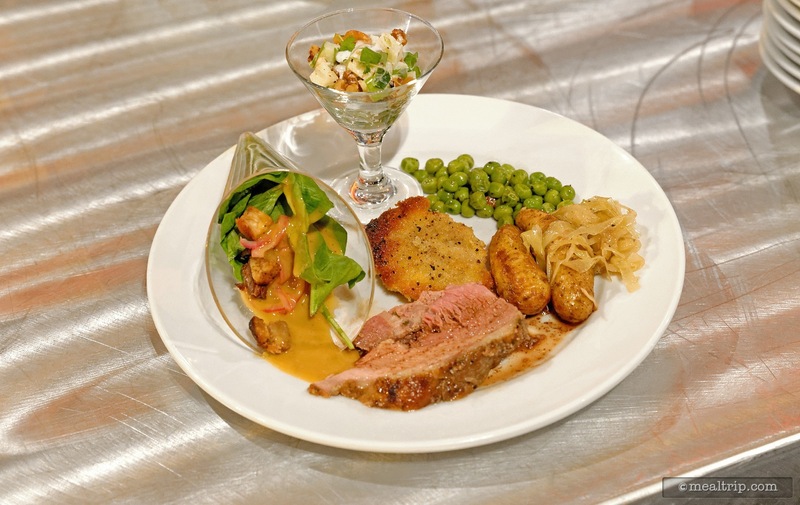 The "Dining Through the Decades - A Tribute to Walt Disney" special event took place on October 24th, 2014 as part of that year's Food and Wine Festival at Epcot. Because some of these events only happen "once ever", reviewing them may seem to some, as having little value. I disagree though. We can tell a lot about the future, by looking at the past. Being able to compare events that took place years ago, with what is begin offered today, is one of the things that Mealtrip.com set out to do. In some ways, reviews are a historical reference point more than anything. They are all about things that have happened or that just took place. Before I get into the accounting of what this event was... I would like to take a second and remind our readers that our "open review" system is much more useful... if you write a review or even just leave "point scores" for any event that you have been to or any restaurant that you dined in during your stay. Okay, on to the slightly different than usual review! I'm totally going to copy and paraphrase some of the content that was written in the event program for this event. Someone spent a lot of time writing it, and it's really interesting stuff about food and Walt Disney. Far more interesting than anything I could come up with on my own. 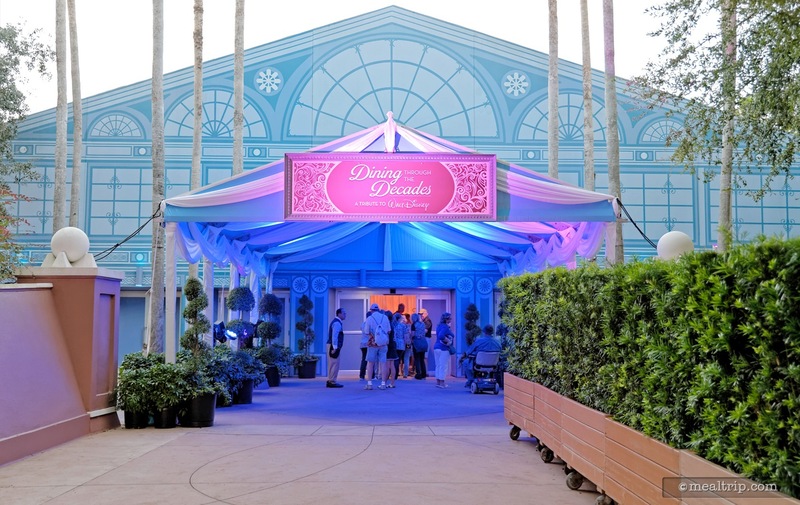 The Dining Through the Decades event was held in the World Showplace pavilion as part of the 2014 Food and Wine Festival. The event offered a two-tier pricing system which was $99 for General Admission and $119 for Reserved Seating. 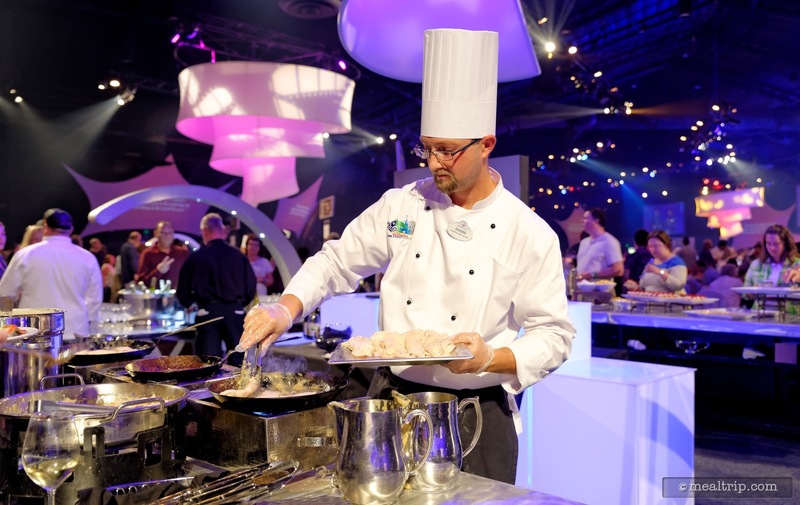 There were five or six "stations" set up, that were half made-to-plate and part "serve yourself" so… sort of half buffet and half "party for the senses". I know… strange sounding… but it worked out really well. 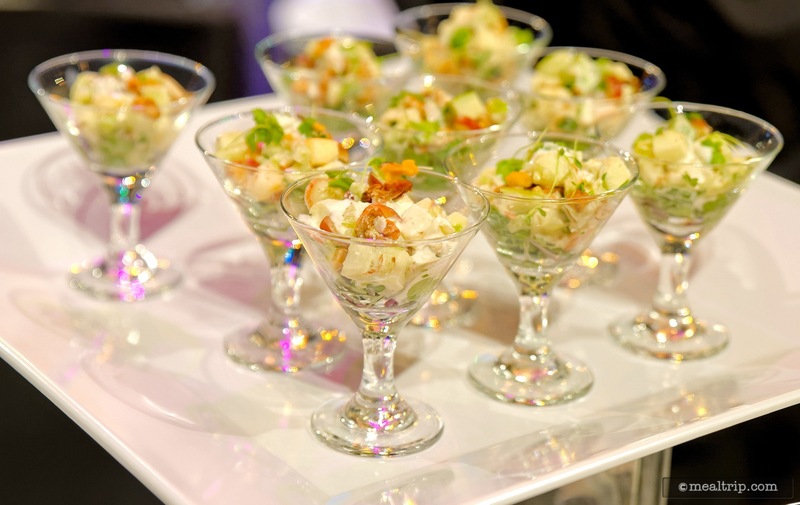 Each station had it's own adult beverages that were intended to be paired with the food items from that station. All of the stations were duplicated on each side on the main stage area, to help keep the lines from getting too long at any one station. Guests were free to move around anywhere they wanted in the giant World Showplace building. There were three "sets" of live entertainment over the course of the evening. 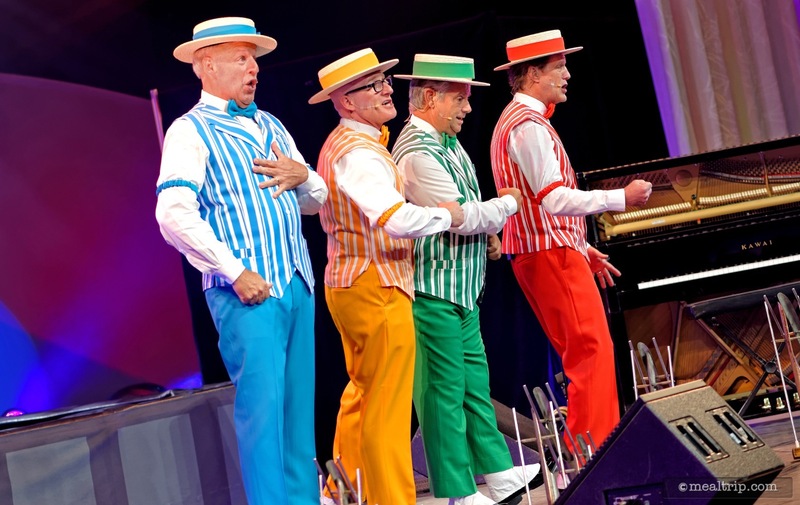 Two sets were provided by the Dapper Dans performing some of their Main Street hits, along with a few special numbers that you don't get to hear as often. In between the two Dapper Dan sets, the legendary Yehaa Bob Jackson performed, and they could not have picked a more suitable musician for the event. 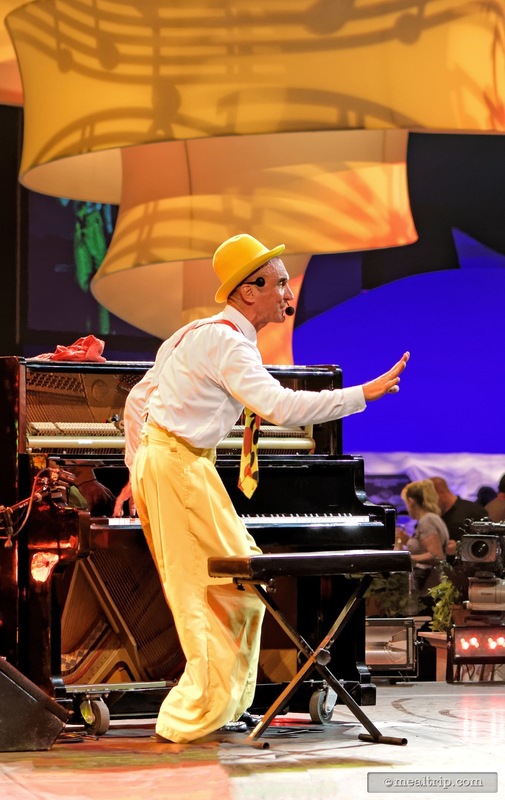 Yehaa Bob was awarded the Disney Legacy Award in 2013 and is just one of those performers that embodies the best of Disney. If you haven't had the pleasure of seeing him perform, Yehaa Bob can usually be found at the Rivers Roost at Port Orleans. It's worth the extra effort to stop by, if you're not staying at Port Orleans. 1901-1924 : Beginnings - Casual Dinner Station featured items like Pan-fried Free range Chicken Breast with Meyer Lemon Pan Gravy, Chicken fry Cube Steak with White Truffle Gravy, and serve-yourself sides like Smashed Potatoes infused with Sour Cream and Chives, Corn and Edamame Succotash and Stewed Tomatoes with Okra. "The love of home-cooked simple meals likely began during the four years on the family farm in Marceline, Missouri, followed by a move to Kansas City where Walt started his career as an artist. After a year driving an ambulance in France, he returned to Kansas City and became an animator. Walt settled in Los Angeles at the age of 21, founding what became the Walt Disney Studios with his older brother Roy." 1925-1936 : Family and a Mouse - Sunday Dinner Station featured such items as a Leaf Spinach Salad Cone with Quick Pickled Onions, Pork Belly Croutons and a Brown Sugar Vinaigrette (loved those croutons), a cute Waldorf Salad in a Martini Glass with Micro Celery, Panko Crusted Veal Cutlets with Wild Mushroom Gravy and Carved Garlic and Rosemary Roasted Leg of Lamb with Red Wine Pomegranate Sauce. "Walt became a husband (1925) and father (1933 and1936). The very stylish Mrs. Lillian Disney named the little mouse that we all know today, and surely added some sophistication to the dinner table. Walt introduced sound and color into animation, and began winning the first of many Academy Awards for his pioneering efforts." 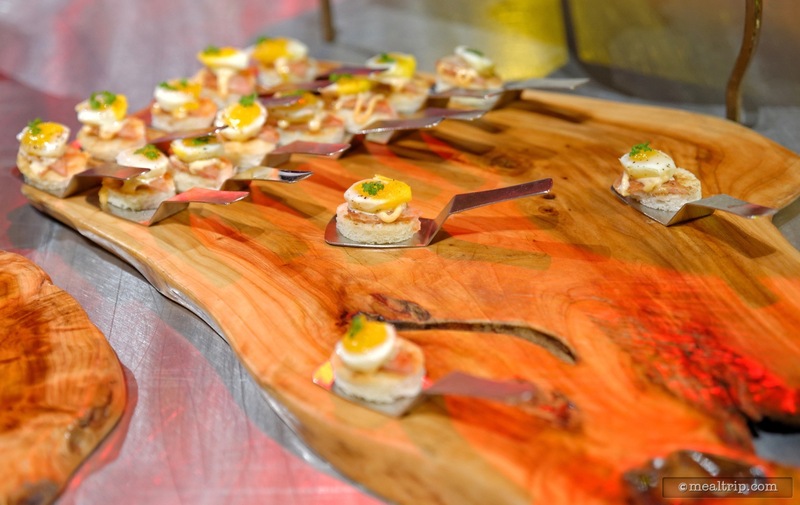 1937-1955 The Golden Age - Late Night Snack Station (this was one of my favorite tables of the event) featured some very unique open face mini sandwiches plated on spatulas! 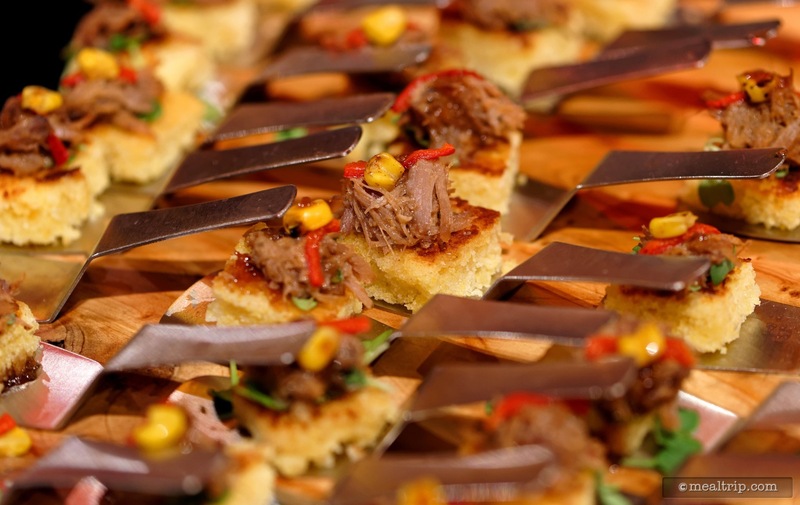 These included a Pulled Beef Shortrib on Brioche with Caramelized onion Relish, a Charred Spam and Quail Egg Biscuit with Honey Aioli, and a Shredded Pork on Corn Bread Sandwich with Apple Pear BBQ and Micro Greens. "Full-length animation features, live-action films and a little project in the orange groves of Anaheim, California, made Walt very busy. Working long hours called for late night snacks. His office suite at the Disney Studios had a full kitchen." 1955-1963 Disneyland & TV - One Pot Dinner Station (this was my other favorite table of the night) there were only three items here, but they were all delicious. A Roasted Guinea hen over Savory Bread Pudding topped with Corn Gravy, an Oyster Stew with aged Cheddar Foam and Lavosh Cracker (cheddar foam… how cool is that? ), and my favorite Walt's Mixed Grill and Heirloom Bean Chili topped with Creme Fraiche. I've been to a couple events over the years where this chili (or one very similar to it) was featured, and it's been spot-on awesome every time. "Weekly televisions shows brought the grand opening and first years of Disneyland into every American home. When the Park bearing his name demanded his attention, Walt sometimes stayed in the apartment above the Main Street Fire Station. 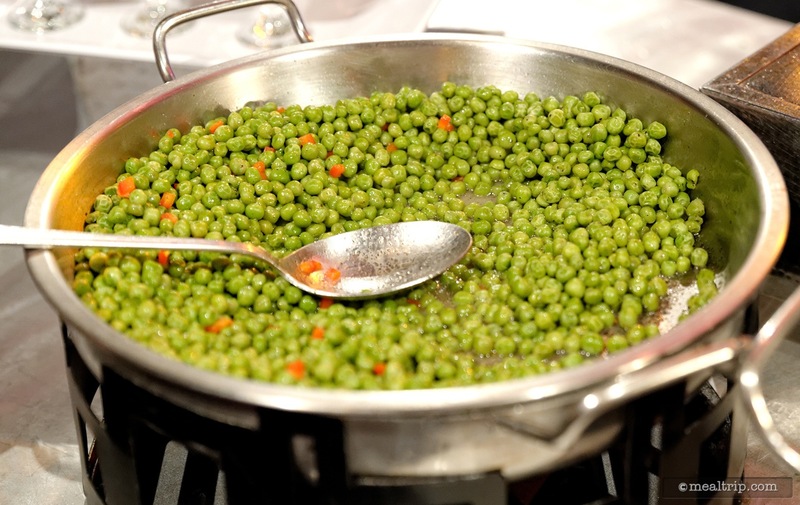 The mini-kitchen had only one hotplate." 1964 and Beyond - Spoonful of Sugar Dessert Station featured two Custard Jars including a Pistachio Ricotta and a Strawberry Balsamic Custard. There were also three mini-pies in Mickey-shaped pie crusts including Lemon Meringue, Caramel Apple, and Boysenberry Custard. Other sweet-treats included Maple Walnut Minnie Cup Cakes, two flavors of Fruited Jell-O Cups and assorted fresh cut fruit, marshmallows, pretzels and cut pound cake for dipping in a warm Chocolate Ganache Fondue. "In 1964, the New York World's Fair presented "It's a Small World" and other cutting-edge Disney attractions, Mary Poppins was a smash hit, and the acquisition of land in Florida began for what would become Walt Disney World, a tribute to the philosophy and life of Walter Elias Disney (1901-1966)." As I mentioned earlier, there were various beverages being featured at the ends of the food tables. Some were mixed cocktails, but mostly wines were available. It was fun getting to try the Fess Parker wines "The Big Easy" and the 2012 Riesling were quite nice, but I'm all about the bubbles… and so the Enchantee Brut, Martini Asti, and FairyTale Cuvee were great to have on-hand as well. 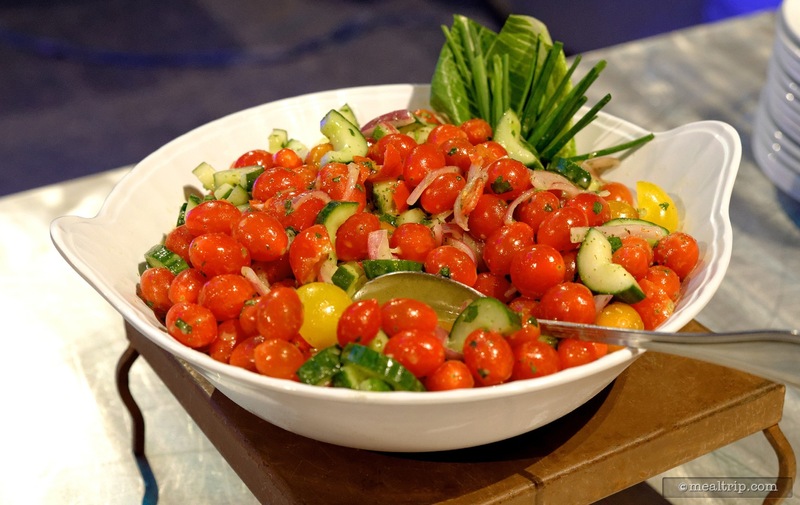 All in all… an amazing event that combined great food and beverages, classic Disney musical entertainment, and some really interesting information about what Walt Disney may have been eating through the decades of his life, and how the nature of the food changed over time. I went to the event on the $99 general admission ticket, and didn't once have any problem sitting down at the various free-range table and chairs that were set up all over the World Showplace. While it's true that you don't really have a "home base" table to leave stuff at... I didn't really have much "stuff" with me, and the nature of the event made it quite fun to roam around and see all the photos and event decor that was placed throughout the building. The $119 reserved seating guests did have a nice, blocked-off area right in front of the stage where the Dapper Dans and Yehaa Bob performed, a private bar with specialty cocktails and beers that were not available elsewhere in the room, a cheese station, and received a small goodie bag. 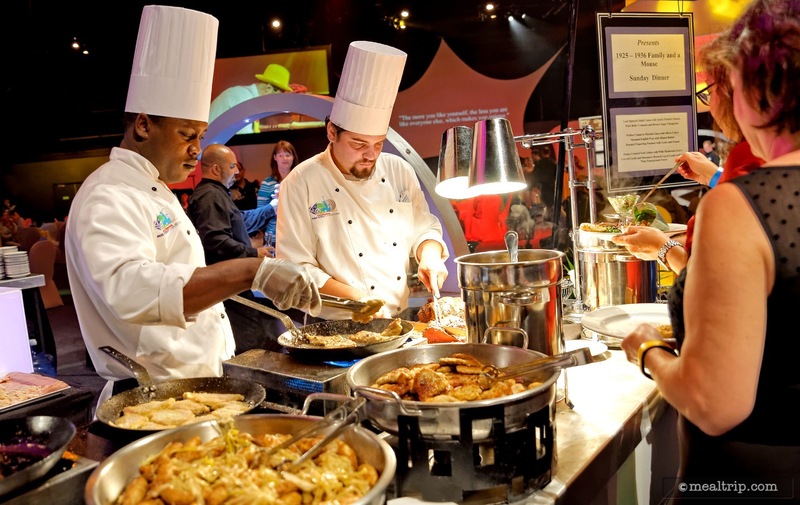 These more tightly themed events (specifically in the World Showplace building) that we've seen being added to the Epcot Food and Wine Festival in recent years have all been a lot of fun, and in the grand scheme of (Disney priced things) a pretty good value, especially when you consider the exclusivity of the event. As I write this... I don't know if we'll ever see this event being offered again. 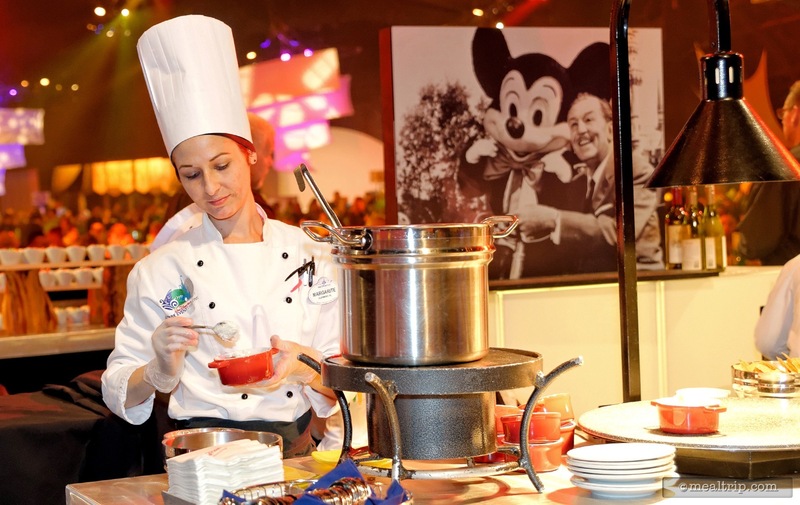 I got to sample some great food, learn a little more about Walt Disney, listen to a couple of iconic Disney musical groups… and it's probably only something that the 300 guests that were in attendance that night, will ever get to experience!